13/01/2015. Dress rehearsal of for the World Premier of Gandini Juggling’s new show 4 x 4 Ephemeral Architectures - a sparkling mix of juggling and classical ballet . Linbury Studio Theatre, Royal Opera House, London. Dancers: Kieran Stoneley, Kate Byrne, Erin O'Toole and Joe Bishop. 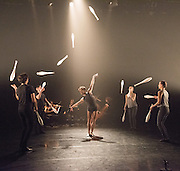 Jugglers: Kim Huynh, Sakari Männistö, Owen Reynolds and Kati Ylä-Hokkala.